Apparently the word is “Valor.” Carnival has apparently decided that Carnival Liberty's mechanical problems are going to persist and will not be repaired as the ship sails during this cruise as advertised. The line announced the next three sailings from Galveston will sail at slower speeds on modified itineraries, and next month the ship will be swapped for the properly-functioning sister ship, Carnival Valor. The complete story appeared in the November 11 edition of Cruise News Daily. The New York Economic Development Corp announced that shore power is ready and waiting for the first cruise ship to dock at the Brooklyn Cruise Terminal that has a big ole cord hanging out the side. Brooklyn is only the second cruise terminal on the East Coast to have shore power capability. 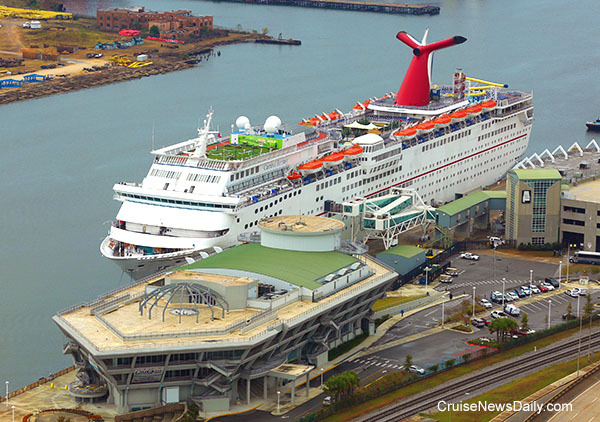 Details appeared in the November 11 edition of Cruise News Daily. Does anybody care that they named the Something of the Seas? The largest cruise ship in the world was named at Port Everglades yesterday, and it has received practically no media coverage. It's either a colossal public relations failure, or nobody cares about big, new ships anymore. 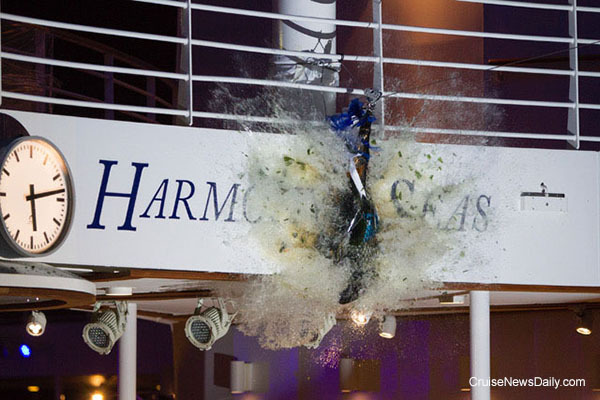 Photos courtesy of Royal Caribbean International. Carnival Liberty sailed from Galveston tonight after having to cancel two sailings due to technical difficulties with the ship's generators. The line previously announced that sailings through this one would have to operate with modified itineraries to accommodated the slower cruising speeds necessary while they were making repairs. Details appeared in the November 10 edition of Cruise News Daily. One British cruise passenger died on Dominica yesterday when the excursion van in which he was riding with 11 others ran head-on into another car. Nine others were also injured in the van which was carrying a total of 12 people. Princess Cruises is the Official Cruise Line of the Seattle Seahawks, and Monday night at the Seahawks game, they honored military veterans Matthew and Brittney Linville for their service in the Army by awarding the couple a free seven-day cruise. The couple's service to the United States includes deployment to Iraq. 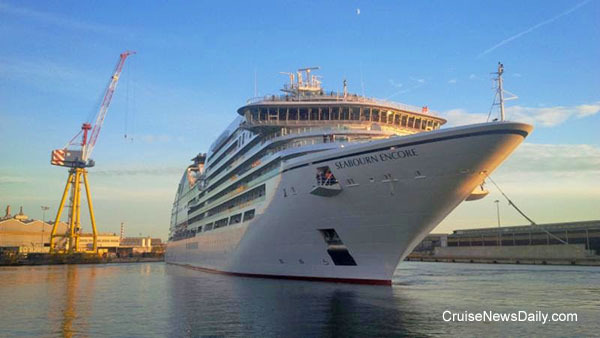 The complete story appeared in the November 10 edition of Cruise News Daily. The city of Mobile had a fantasy, and that was the return of cruise ships to once again dock at their modern, purpose-built cruise terminal. Today Mobile's fantasy came true when Carnival Fantasy arrived at the Alabama Cruise Terminal for a year-long series of short cruises to Mexico. 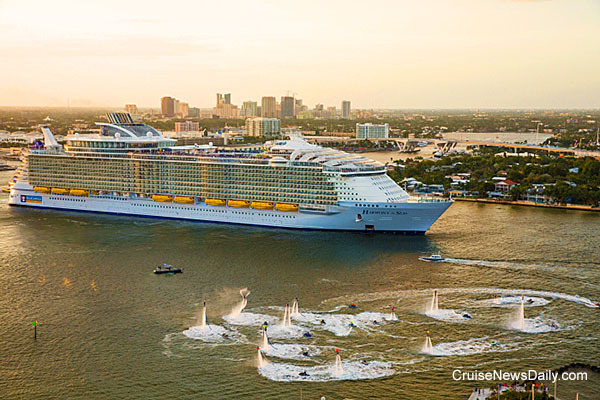 The complete story appeared in the November 9 edition of Cruise News Daily. Photo courtesy of Carnival Cruise Line. All rights reserved. May not be copied or used without express permission. 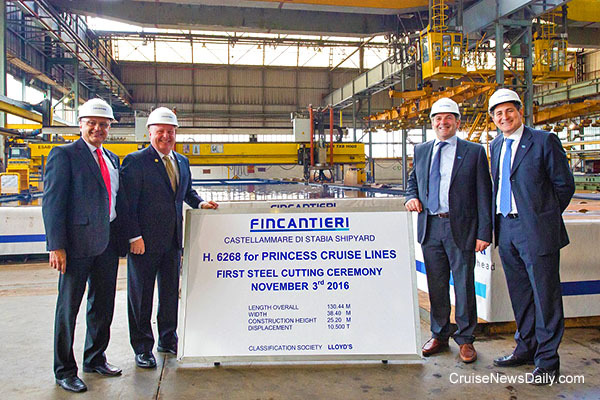 The first steel was cut for the fourth ship in the Royal Princess series. Two passengers from P&O's Oriana successfully fought off an armed gunman in New Orleans. Houston's former cruise terminal is about to take on a new role. Details appeared in the November 9 edition of Cruise News Daily. Carnival Corp has completed a successful test using INTERPOL's I-Checkit system to verify travel documents authenticity and verify they haven't been reported lost or stolen anywhere in the world. Approval was granted today by INTERPOL's General Assembly for Carnival Corp to be the first maritime company to use the system and expand use across the 10 Carnival brands and their 101 ships. 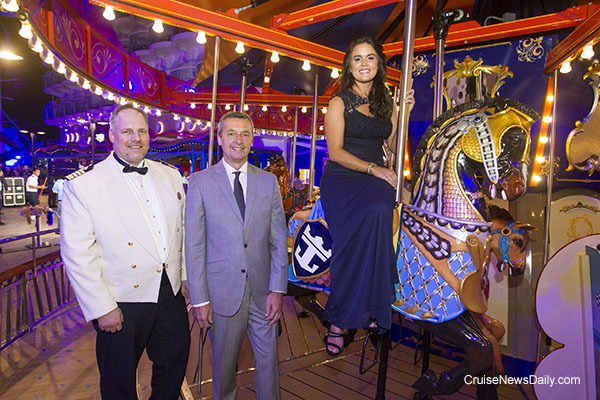 The complete story appeared in the November 8 edition of Cruise News Daily. 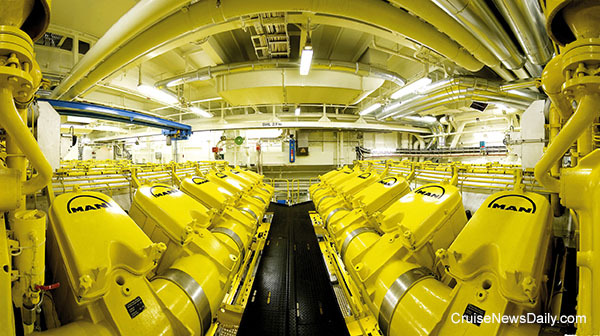 MAN Diesel & Turbo has won the contract to provide engines for three ships being built by Fincantieri for Costa Asia and P&O Australia. Details appeared in the November 8 edition of Cruise News Daily. Photo courtesy of MAN Diesel & Turbo. All rights reserved. May not be copied or used without express permission. Celebrity Xploration is back from dry dock, and the line is ready to begin accepting reservations for its Galapagos' program beginning March 25. Celebrity Xploration is one of the premium line's acquisitions in Ecuador that will give passengers a quite different experience in exploring the protected habitat. The ship is a catamaran that accommodates just 16 passengers. Details appeared in the November 7 edition of Cruise News Daily. This afternoon Seabourn Encore returned to the Fincantieri yard at Marghera after successfully completing its final three-day set of sea trials in the Adriatic off the coast of Italy. Photo courtesy of Seabourn Cruises. All rights reserve. May not be copied or used without permission. Last week Carnival Liberty canceled Monday's sailing after developing a technical problem on the previous cruise that limited its cruising speed. An additional problem was discovered during the repairs, and it was hoped the ship would be repaired enough that it could sail on Saturday's cruise with a modified itinerary. On Friday, however, the ship was still not able to sail and Saturday's sailing was canceled. It is now hoped the ship will be able to sail on Thursday (November 10). That will be a four-night cruise with a modified itinerary calling at Progreso rather than Cozumel. 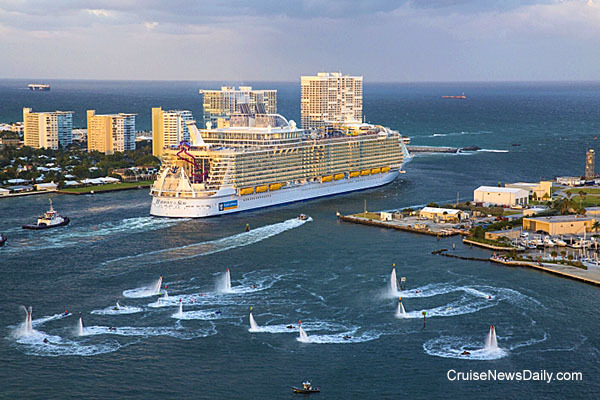 After meeting with her two sisters off the Florida coast on Friday, Royal Caribbean's Harmony of the Seas came on into Port Everglades on Saturday to make her US debut on Saturday.